Steel Decking / Mezzanine Decking / stud welding / Steel Decking profile with Stud Welding | Pune ,India from MAXROOF Corporation Pvt Ltd.
Stud welding is a technique similar to flash welding where a fastener or specially formed nut is welded onto another metal part, typically a base metal or substrate. The fastener can take different forms, but typically fall under threaded, unthreaded or tapped. The bolts may be automatically fed into the spot welder. Weld nuts generally have a flange with small nubs that melt to form the weld. Weld studs are used in stud welding systems. The Stud Welding Process Stud welding is a process by which a metal stud is joined to a metal workpiece by heating both parts with an arc. A key factor that differentiates stud welding from other fastening processes is that the fastener is attached to the workpiece without marring the other side. The arc stud welding method provides highly reliable fastening for a wide variety of applications. This method allows almost any size or configuration of a metal stud to be welded quickly to a workpiece, while providing maximum weld penetration and reliability. 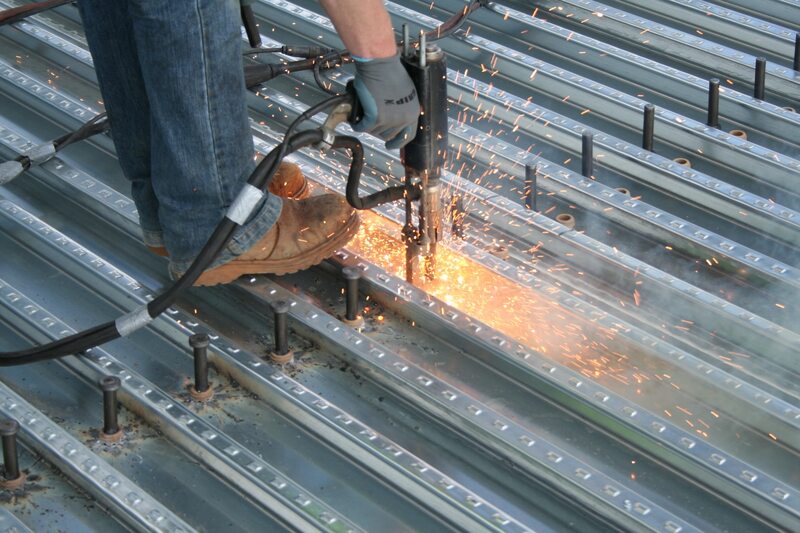 MxDeck54 is an innovative steel decking profile, which is an ultimate lightweight system for all multirise buildings. MxDeck54 acts as a form for the concrete and is designed so that no or minimum propping is required. MxDeck54 is designed for the use with structural concrete and is manufactured with mechanical embossments in the webs to create mechanical and chemical bond between the steel deck and the concrete. The composite action allows the deck to serve as the tensile reinforcement for positive bending in the slab, which is significantly reduces or eliminates the need for rebars in the slab and lowers material and labor costs. The strength and durability of the steel provides a solid platform for construction on top of open web joists, structural steel, light gauge framing or masonry walls. MxRib1010 is a curvaceous roof profile sheet. The curvaceous design not only adds strength to the roof profiles but also gives it an elegant look. This also translates into long spanning capabilities. MxRib1010 can be used as roofing as well as walling applications for various industry segment like factories, warehouse, infrastructure project etc. MxRib1010 made of high strength steel and despite its lightness has remarkable recovery after deformation. MxRib1010 profile has been designed to ensure excellent water egress. ' MxRib1010 profile has been widgly accepted as it serves two most' important purposes, strength & aesthetics and hence it becomes architects first choice. MxRib1010 profile can be factory cranked, curved and bull nosed to a wide range of radii to suit architectural requirements. MxRib1010 side lap design makes it completely watertight (Ref fig. - 03). The unique feature of anti-capillary groove at side laps makes it totally weather proof. Any moisture drawn in by capillary action is trapped and dispersed by normal run - off.